Bobby, the tiny kitten with the bobbed tail. At three pounds, bobtailed Bobby is still a tiny bundle of love (born early last month). 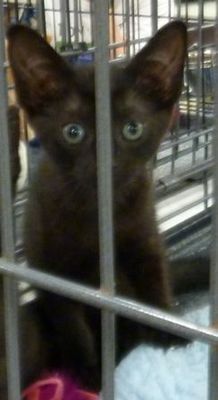 He and his siblings get along well and are described by their foster family as sweet and friendly. He’s tested negative to FIV and FeLV, so all this kitten needs is a happy home. Bobby is available for adoption through Concerned Citizens for Animals in South Carolina.